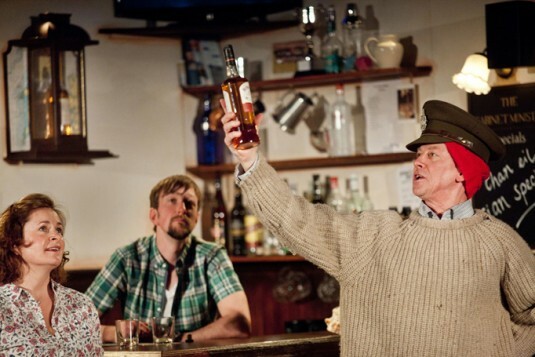 Reinforcing its commitment to create theatre for the whole of the country, the National Theatre of Scotland is sending its new Gaelic adaptation of Compton Mackenzie’s Whisky Galore off around the small halls and arts centres of the Highlands and Islands. 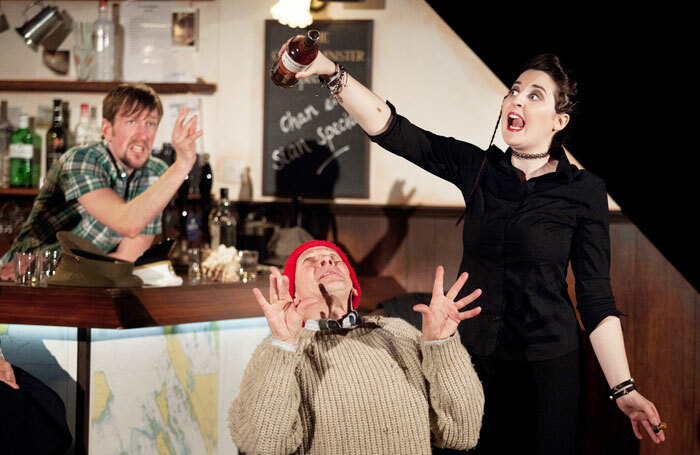 A three-way co-production, it is new Gaelic company Robhanis Theatar’s first outing and draws in Oran Mor’s lunchtime theatre specialists, A Play, a Pie and a Pint. Sitting tight with a five-strong cast, Iain Finlay Macleod’s adaptation (the first into Gaelic) is no tourist-orientated throwback, but a pleasingly modern adaptation of the novel. 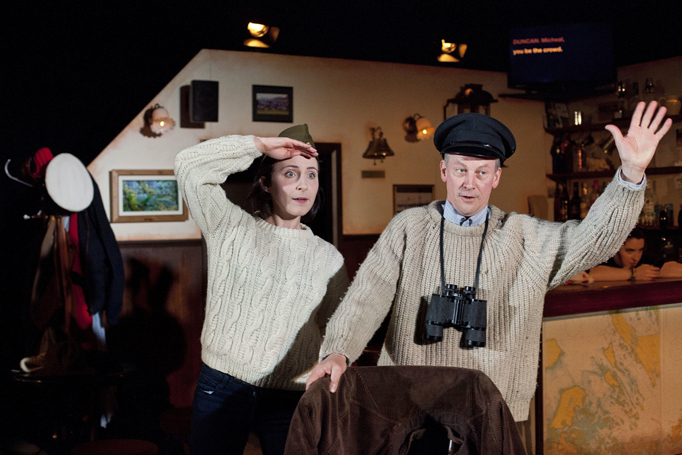 To cut down the sprawling tale of the SS Cabinet Minister, which ran aground off Eriskay with a cargo of whisky during the Second World War, Macleod frames his version in a modern-day pub. It’s Friday night on Todday and the ferry has been broken down for a fortnight. There’s no whisky left – and beer is rationed to a pint per customer. Iain Macrae captures the boredom of lonely would-be drinker Duncan, while MJ Deans as barmaid Sarah rolls her eyes in disinterest and taps away on her phone. 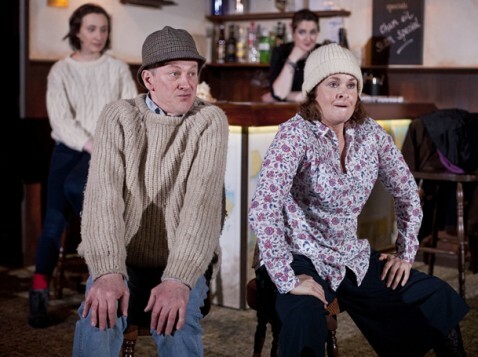 Into their quagmire of boredom waltzes live wire, hyperactive Maire (Roseanne Lynch), hot off the plane from London and wanting to get in touch with her Hebridean roots. Not to mention to practise her Gaelic. This being a pub called the SS Cabinet Minister – with a near-sacred bottle of Stag’s Breath whisky salvaged from the original wreck a feature of the decor – of course Duncan is going to enact the story for her. 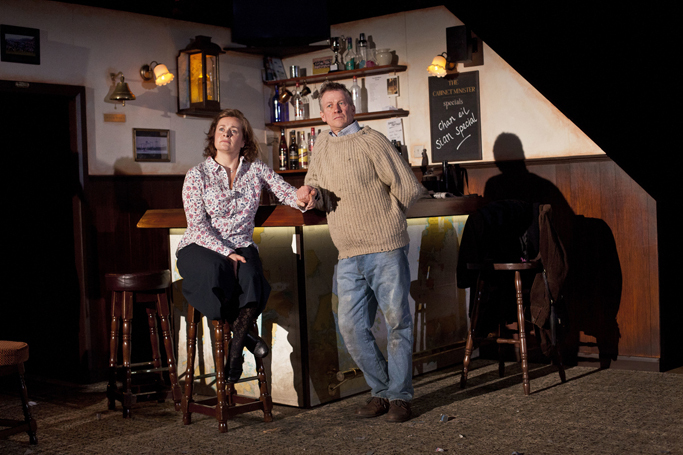 The Gaelic adaptation – with English surtitles scrolling through the bar’s television set – allows Macleod to find the humour of the original, but twist it to be from the Gaelic point of view. Director Guy Hollands brings out a set of excellently-observed performances, but is mostly responsible for the production’s strong sense of pace. The acting out of the well-known story of the wartime whisky is snappy and caricatured. Macrae, in particular, has ball swapping hats between characters, putting on silly ways and playing with its presentation in a manner which a pantomime veteran would be proud. Drawing into present-day, however, Hollands lets naturalism take over in a way that accentuates Macleod’s clever echoing of the original in the events and relationships in the bar. This is the NTS’ second foray into a small-scale touring pub-set production. Unlike the site-specific Prudencia Hart, however, this takes its own set with it. Claire Halleran’s design is a neatly practical foldaway corner of a bar which looks the part, with Paul Claydon’s clever lighting ensuring the Stag’s Breath whisky has a suitably shrine-like position on the wall. The only drawback is its brevity, necessary for the lunchtime format. There is material here, in this form, for at least an extra 20 minutes which would bring a more substantial and satisfying piece, even though what is here is highly entertaining.